The Ford Ranger's just about ready to kick the bucket, gas prices are higher than the dress neckline of a Texas polygamist cult and CAFE standards — well, let's just say they don't leave much room for error on the high side of the gas guzzle range. Sounds like high time Ford announced a new pickup truck, doesn't it? Perhaps. But only if said pickup truck is the purported return of a badge not seen from Dearborn since 1983 — F-100. 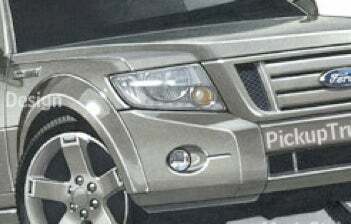 That's right, we're hearing rumors this morning of a mini-pickup based on the current F-150. Well, it'll be based on the F-150 in look, feel and most importantly not in size. If it's coming, we're told to expect a Ford F-100 at 9/10ths the size of the 2009 Ford F-150 to hit dealer lots in the 2011 model year.